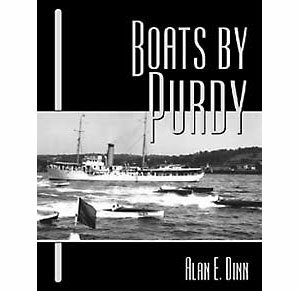 This is a fascinating and an authoritative history of the Purdy Boat Company, one of the most famous makers of custom yachts and racing boats in the 1920s and 1930s, based on official company documents and correspondence and on reminiscences of family members and boat owners, and augmented by many photographs and line drawings of classic Purdy boats. The spark that lit the ignition for this story was the discovery of the company's original record book, the Record of Boats Built, in a Port Washington, NY, attic. The book was later donated to the Cow Neck Peninsula Historical Society of Port Washington, and is now in the archives of the Nautical Center at the Port Washington Library. It came to the attention of author Ginger Martus, who contacted Alan Dinn, a grandson of Ned Purdy, and they collaborated on an article on the Purdys for WoodenBoat magazine in 1995. That article formed the basis for the book and the book turned into a labor of love - love of family, love of history, love of fine craftsmanship, love of boats and the sea - and a monumental research project involving many for whom the name "Purdy" evokes a bygone era of classic race boats and cruisers - owners and former owners of Purdy boats, librarians and museum officials, classic boat enthusiasts, family members, and others - all of whom contributed to the book and make it a living testimony to Ned and Gil Purdy, designers and builders of some of the best raceboats and cruisers America has ever known. Alan E. Dinn is a grandson and partial namesake (E. is for "Edward") of Ned Purdy. He has lived most of his life in Port Washington, New York, home of the Purdy Boat Company for many years; in fact, the first house he lived in had been Ned and Clara's Bayview Colony home. Alan attended the Port Washington Public Schools, graduated from Rensselaer Polytechnic Institute with a bachelor's degree in Aeronautical Engineering and also holds a master's degree in Applied Mathematics from the State University of New York at Stony Brook. After graduating from RPI, Alan was commissioned in the U.S. Air Force; he served as an aircraft maintenance officer for four years, including a year in Vietnam, and attained the rank of Captain. Since 1969, Alan has been employed as an engineer at the Grumman Corporation (now part of the Northrop Grumman Corporation), where he specializes in preparing logistics support plans and proposals for advanced military aircraft and test systems. He also puts his writing skills to use as Clerk of the Vestry at St. Stephen's Church (which members of the Purdy family have attended for more than 75 years). He is a member of the Nautical Advisory Committee of the Port Washington Public Library, an amateur genealogist, and a Lay Eucharistic Minister. Alan is married to Susannah Loudon Hanson, RN; and when not involved with other projects, they often kayak in Manhasset Bay, near the site of the 1925 Gold Cup regatta that brought the Purdys to Port Washington.